Hardwood floor replacement isn’t always a necessity. The good thing about hardwood is it is actually one of the most durable flooring types. It can last for several decades, even longer, with proper care. And, it’s among the most aesthetic types of floor, often prefered over many others, even tile. What’s more, it doesn’t take much to care for hardwood. Just sweep it weekly and periodically, have it refinished. However, there will come a time when a hardwood floor needs to be replaced. 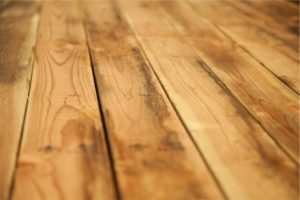 If you are planning to do some remodeling, it’s not a bad idea to take up hardwood, especially if it is nearing the end of its life. You might consider having the hardwood replaced with natural materials or engineered materials. You can also remove the wainscoting and replace it, if you’re renovating. But, if you’re just replacing the flooring, you have a number of choices. For instance, you can replace it with ceramic tile or concrete. Separated boards. When the boards begin to separate and gaps remain for a long period of time, this is sign hardwood needs to be replaced. In general, boards will show some separation, due to temperature and moisture levels. But, when the gaps stay and the boards don’t come back together, it’s probably replacement time. Deep gouges. Another hardwood replacement sign is the appearance of deep gouges. In some instances, small gouges can be filled or a few boards replaced. But, if there are a number of big gouges, it’s a sign replacement is in order. Bucking. Buckling or bowing is a phenomenon of the hardwood planks pulling away from the subfloor underneath. This doesn’t happen often and is rare. But, when a hardwood floor buckles, it means it must be removed and replaced with different flooring. Cupping. Boards which are warped, causing the edges to rise while the middle sinks in is known as cupping. Like buckling, this isn’t too common but it does happen. The warping will only worsen over time, so it’s time for a replacement. Crowning. If the planks begin to crown (which is the opposite of cupping), the edges will seem to curl under while the middle rises. And, when crowing occurs, the floor is generally not salvageable and must be replaced. If you need hardwood floor removal, go ahead and phone 800-433-1094 or visit Junk Garbage Removal. We can help with any sort of construction debris removal for remodeling projects, no matter the size.